Choppy conditions gave the athletes a test of their skills, running down the course was harder as you couldn't see the buoys because of the sun. It was quite a poor turn out, but that could have been because of the time it was held. Remember guys, if you want flat water you've got to get up early! The club held it ’ s AGM in March and it was well attended. There is only one change to the committee, Brian Edwards stepped down as ski secretary and was replaced by Peter Doxsey. As we had a very quiet 2005, we are determined to make more of an effort this year to bring the club together and hopefully give it more of a club feel. 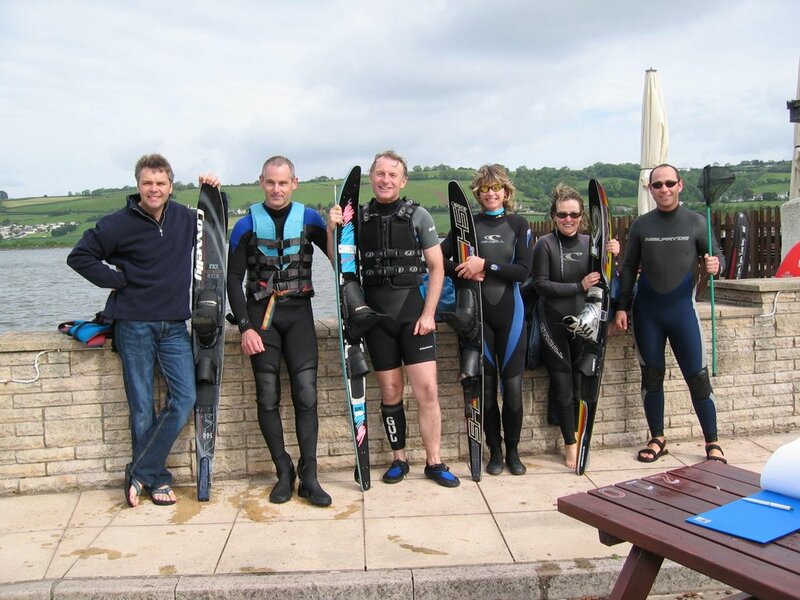 It ’ s very hard when we don ’ t have facilities, but if we don ’ t work together to make it a success, we could have it taken away from us and that would mean no more skiing in the river Teign! A big thank you to everyone who turned up on Saturday 1 st April. We hired a professional tradesman to carry out the carpentry on the jump, but he needed some extra hands. After the jump everyone turned their attention to the slalom course. I know we say it every year, but the club wouldn ’ t be able to operate without the help of members giving up their free time to keep the jump and slalom in working order. If you are able to help with works parties in the future please contact Rona Boyne (Mastercraft Barefoot 200) on 01626 873787. They only equate to a few afternoons a year and we only hold them when the weather isn ’ t at its best. Get practising... Our first competition of the year is on Sunday 28th May. Peter Doxsey (red Global Mirage) is now responsible for our club ’ s competitions, so it would be nice if you showed him your support by taking part in our first competition. Don ’ t miss Mastercraft ’ s demonstration down at Coombe Cellars beach on Saturday 10th June. Barbara Hawkins (yellow Tremlett) has arranged for Mastercraft to come down and demonstrate their range of products with a pro wakeboarder. Not many of us get the opportunity to see a pro in action, so make sure you ’ ve got a good spot. We hope to start just after 1700hrs. Keep your credit cards handy because you ’ re sure to see a new toy that takes your fancy! World No.2 and European No.1 skier Jason Seels, is available to coach club members of all ages and abilities in slalom, trick or jump on Tuesday 15 th August. BOOK YOUR DAY OFF WORK NOW! Now that the jump has just had a major renovation – this could be your opportunity to try jumping for the first time, or simply to improve your technique. We will do our best to make sure that all interested members have at least one coaching session, but due to the expected high demand, this cannot be guaranteed. Please contact Keith Broome (Riff Raff) to book your place (Tel: 01803 402525 or email: keith.broome@blueyonder.co.uk). Steve & Rona Boyne, Guy & Harriet Langworthy (Mastercraft X19) and Keith have already offered the use of their boats. Please let Keith know if you can bring your boat along for use during some of the coaching day. Jason is currently training in the USA and is returning to England for the summer to take part in a number of competitions (hence he is only available for midweek coaching). To ensure that skiers being coached have the flattest possible water, members skiing that day must keep out of the whole competition area. They must keep well towards Arch Brook, on the Coombe Cellars side of the river (in order to minimise boat wakes coming onto the slalom course and jump). NB Coaching is only available for club members. On Saturday 30 th September we will be having a BBQ with live band Limited Company. We will be holding it at Combeinteignhead village hall and for those who want to camp overnight; we are asking if this is possible at Long Meadow Farm. Watch this space for more details nearer the time. 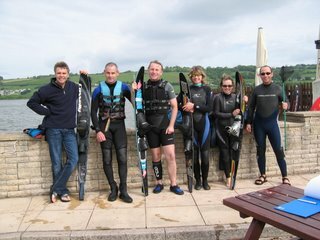 Remember our club is affiliated to British Water Ski. As well as receiving their magazines you can now visit their website at www.britishwaterski.org.uk for information on anything water ski.